Stunning Thrope Perrow Arboretum, an 85-acre (34 ha) woodland garden near Bedale in North Yorkshire, makes for a great day out. Thorp Perrow holds what is considered to be one of the finest collections of trees and shrubs in Britain. It was created by Colonel Sir Leonard Ropner (1895-1977) who began the Arboretum in 1931. As well as the gardens founded by Leonard Ropner, Thorp Perrow also includes Milbank Pinetum planted by Lady Augusta Milbank in the nineteenth century and the sixteenth century Spring Wood. The arboretum is home to five National Plant Collections; Tilia (Lime), Fraxinus (Ash), Cotinus (Smoke Bush), Laburnum and Juglans (Walnut). Thorp Perrow provides all year colour. Winter brings a display of Hamamelis (Witch Hazel) and Galanthus (Snowdrops). In springtime arboretum bursts to life with finest and most extensive plantings of Daffodils in the north of England, including some old and unusual varieties. The dafofodils are followed by blossom on many of the trees, a carpet of colourful bluebells and bold drifts of wild flowers. Midsummer Hydrangeas, Wild flower planting and an array of plants to attract wildlife are also featured. 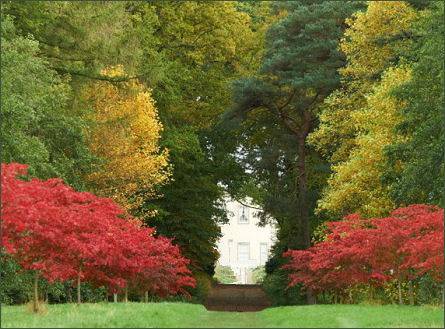 Perhaps the best time to see Thorpe Perrow is in the Autumn which brings spectacular colours all over the Arboretum, but in particular the three Autumn Bays. Thorp Perrow also boasts ornamental lakes, scenic walks and trails, a playground, a tearoom, and a popular a Birds of Prey Centre containing one of the largest collections of birds of prey in the north of England, flying displays are held every day. 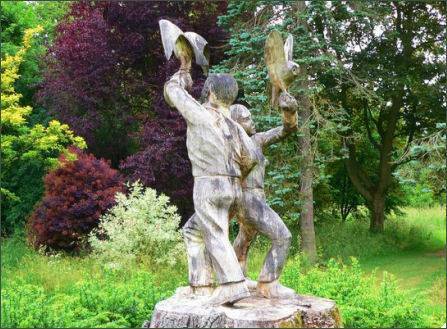 Thorp Perrow Arboretum is situated on the Bedale to Ripon road, just south of Bedale, some 4 miles from Leeming Bar on the A1.